The weather is frigid here in the NY area, and since I drink hot tea year-round, I look for something with an added kick of warmth and comfort when the icicles form in the subway system. Masala chai is my go-to, with warming spics and comforting creamy sweetness. I usually make my own from scratch, which is my favorite way to go. See, icicles in in the Times Square subway station! I was recently at Patel Brothers, a large Indian grocery store in Jackson Heights, Queens, where I made a beeline for the tea aisle. This wasn't easy to do given all the tasty distractions along the way, but I was on a mission. The tea aisle consisted of different varieties of black tea (bagged and loose), and a few types of instant masala chai. I was intrigued and ended up taking home a mix that was loose tea with added spices and flavors. I was skeptical, but curious. The ingredients list in order: tea, ginger, black pepper, long pepper, nutmeg, cardamom, clove, cinnamon. It also says 'contains added flavor, natural masala'. The ingredient list is promising, and I like that you can see tea. The leaves are CTC processed, which I believe is common in masala chai. I boiled the tea in a cup of water, added the same amount of milk, and let the whole thing reduce for a few minutes until the water cooked out a bit. A few teaspoons of sugar at the very end, and the tea was ready for its close-up. I was surprised at the result. It tasted like my idea of a good masala chai. Spicy, humming with caradmom, ginger, and cloves with a peppery finish. I could even taste the cinnamon. Not as nuanced as a homemade version, but still satisfying. For under $5 a container, this was a good purchase. The large container will last a long time. The 'natural ingredients' give me pause, since I don't like mystery additives in my tea. But this is a tea I'll reach for when I'm craving masala chai and missing the proper ingredients. 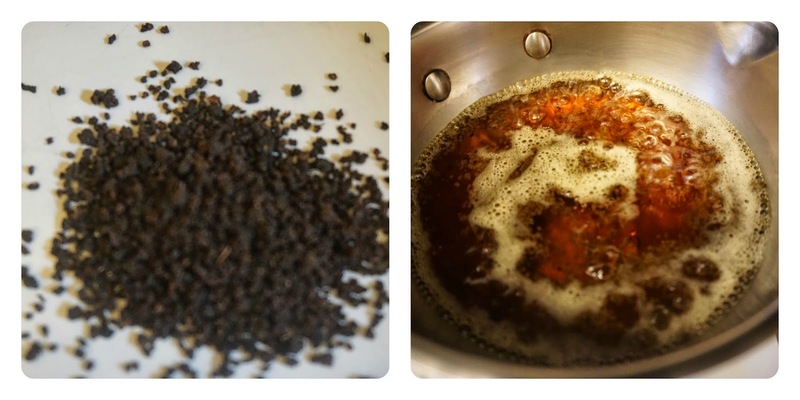 If you are looking for alternative ways to create masala chai quickly and cannot get to an Indian grocery store, you can prepare a loose masala chai mix with milk and sweetener similar to what I did above, try powdered Tipu's Chai or use delicious Dona Chai if it is sold in your area. Cozying up with a mug of warm masala chai and my favorite little photobomber and the Littlest Tea Critic is my idea of a perfect winter afternoon. Even when they steal large glups of my tea. What's your favorite tea to sip when the temperature is unbearably cold? That was a nice read for a masala chai purchased at an Indian grocer. I have been enjoying Celestial Seasoning Teas because when I am at the grocery stores they usually have this on sale 2 for $5; since having obtained a most horrible cold, I find my teas must have honey and lemon as part of the ingredients. I did purchase recently Celestial Seasoning Green Tea with Jasmine and Lemon and I am enjoying daily cups of this nicely hot.